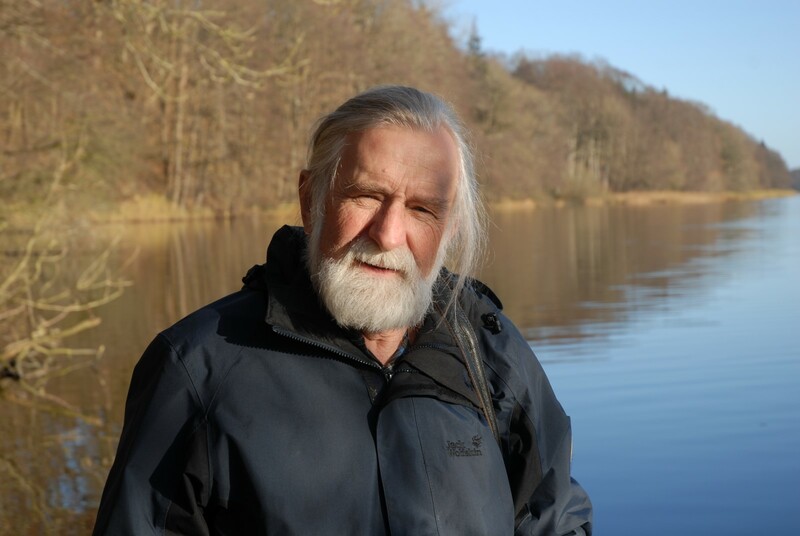 I meet Harm Paulsen (70), the best known and longest working experimental archaeologist in Germany, in his apartment in Schleswig. Although the rooms aren't small, it is only possible to move around by holding in your belly and not breathing, as everywhere, standing, hanging or lying around, is evidence of Harm's professional and private life – a clear line between the two is not visible. There are roughly 15 wooden spears with projectiles of all ages in the umbrella stand, next to it a magnificent Viking helmet, bows, harpoons, lances, quivers... Many glass cabinets filled with exceptionally well made stone tools and beautiful fossils are lined up in the hallway, while a number of rooms, including the living room, are full of textbooks on various disciplines. A true wonderland for everyone who loves history as much as Paulsen. As the weather was sunny and clear, despite it being the beginning of December, we decide spontaneously to go for a walk; this turned into several hours of discussion on the history of Schleswig-Holstein over the last 10.000 years and included a guided tour of a tumulus, a visit to Harm’s favourite spot on the lake and a natural beauty. The fields became smaller, you don't need to cut down two hundred oak trees with an axe again to see how that works. You can get cracking at it with improved scientific methods, slow-motion pictures and better techniques. But everything has been done at least once. For me, it is important to support scholars and students with my experience. I would imagine that we as specialists should take on a more lecturing role to provide others with our knowledge, who, due to lack of time, cannot just learn it all. Once we are back at his place, I had the chance to squeeze information out of him for a whole evening, although I hardly needed to ask anything at all. 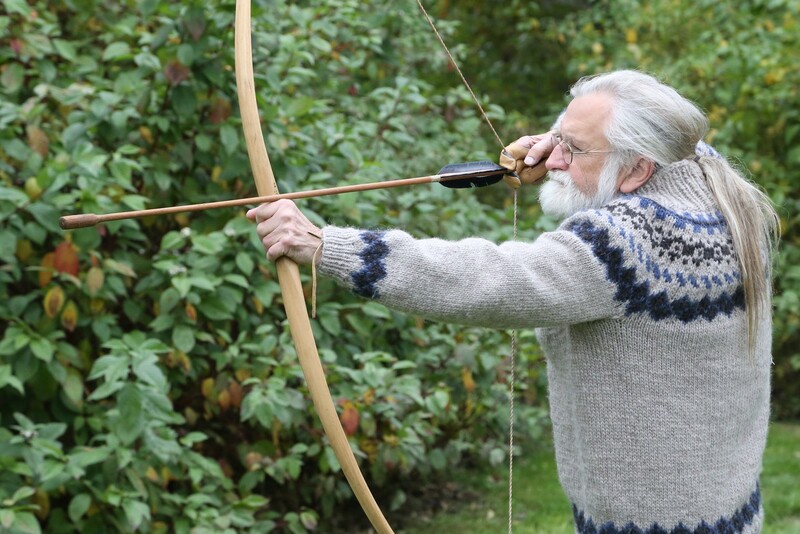 Dear Harm, how did you get involved in experimental archaeology in the first place? I spent a lot of my free time at the museum in Lübeck. Even in primary school people called me “the professor”, someone who knew everything better than anyone else, but I had a very nice teacher who was able to appreciate all of this and so I always had the best marks in history. I often brought the things I found at home to school, because after we moved, I found a complete Stone Age dwelling on the ground of our market garden. 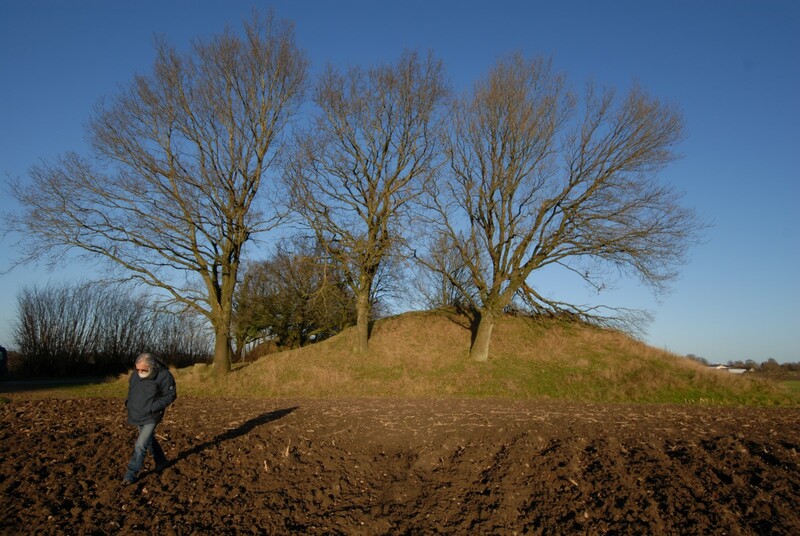 I did some research, reported my findings, and lo and behold, there hadn't been any trace of a Middle Neolithic settlement in the area around Lübeck before. 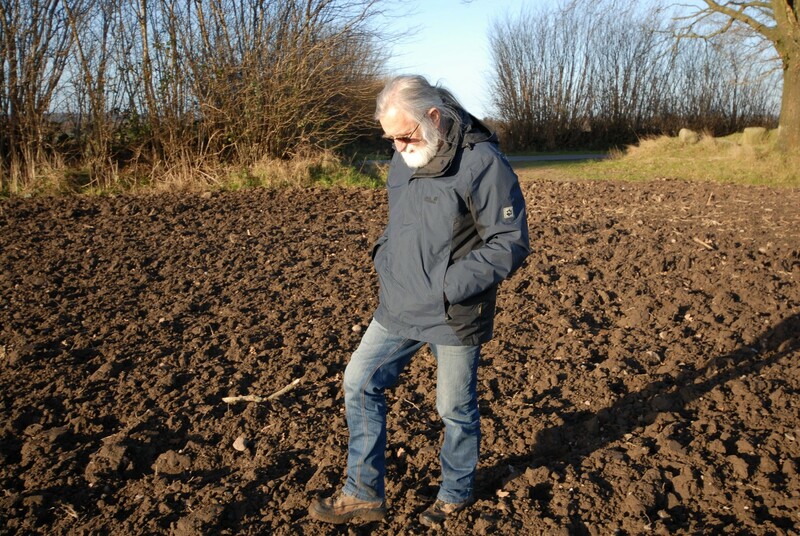 After a test excavation, the Landesamt (federal state office) decided that a big excavation was not worthwhile, because there were asparagus trenches all over the place and the results would be disturbed. I kept on going anyway, wrote reports, and drew my findings, all of which is still kept in the Landesamt. But the big thing came only when I was in high school. Back then, children weren't brought to school and picked up afterwards, I had to walk eight kilometres each day, in all weather conditions. A lot of those wet blankets today wouldn't survive that at all (laughs). On my way to school I passed Bäckergrube Street. After the war, they tore down a whole block of medieval houses because they were destroyed by bombing. I recognised the old sewer trenches in the slag but the construction worker just started to take it all away. I immediately called the city archaeologist Herr Neugebauer who said: “I'm sorry, but there aren't any spare capacities.” I couldn't bear that thought and climbed over the fence onto the construction site. A foreman came instantly and shouted: “Go away boy, what do you want here?” I asked him: “What are you doing with all that slag?” He answered that it was all going to the rubbish tip in Niemark. I grasped the situation quickly: It was a distance of 18km. “What would you think about the idea of putting everything on our field at home?” The foreman asked where exactly home was and I said: only three kilometres away. He didn't need to think about it for too long. I called back home and thankfully my mother answered the phone: “Sure, humus is good for the soil, you can put it on the sandy field!” I joined the construction workers in their truck and told the driver where to place the first load, the second and the third et cetera. That is how I created my own stratigraphy! At the end of the day, the bare field looked like a bunch of huge moles had plied their dreadful trade. Then my father came home and exploded; he said it was my problem now. However, I was allowed to store my finds in the tulip cellar. I asked for four finds to stay in my keeping for 99 years, they are up there on the shelf. Four complete ceramic pots! As early as the 1960s, there were many fascinating objects in the museum and that's why I wanted to study. But my grandma always said: “What good is the best academic title, if you don't have food?” I completed an apprenticeship as an electrician but after a serious accident, I was knocked out. When I was recovered, I wasn't able to work in that field any more. I started working for the Lübecker Museum as a general employee, sifting through the rubble of the cathedral museum, almost re-excavating it. Thanks to old catalogues, I was able to piece together some of the burnt stone tools. My fascination for stone tools was unbroken and even back then, I had started to experiment with flint. I took the bus – what a trip – to the Brodtener Ufer (riverbank), where there was not a single soul at that time. I brought back a whole backpack full of flint slabs. I learned the punching technique quite quickly; the blades were getting longer and more beautiful. I tried working on axes too, sharpening them on the sandstone steps of the stairs behind the house, which started to wear down. My father scolded me and asked what kind of nonsense this is, but after switching the sandstone steps, he let me be. The people in Lübeck liked that I was experimenting. Neugebauer always said: “Oh that's so interesting, you have to be careful not to make an original!” In 1967, Schloss Gottorf (Federal State Museum of Schleswig-Holstein) noticed me, but they weren't interested in flint knapping techniques. I kept myself busy with other things; towards the end of the 1960s, I made a K-axe from beautiful diabas, which I found on the beach. It looked like a cucumber and didn't need a lot of re-shaping, just polishing and sharpening. With the beginning of the 1970s, there were other activities. I made a film about Stone Age techniques, which is still running somewhere, with a man with the telling name “Kampfhenkel” (fighting handle). 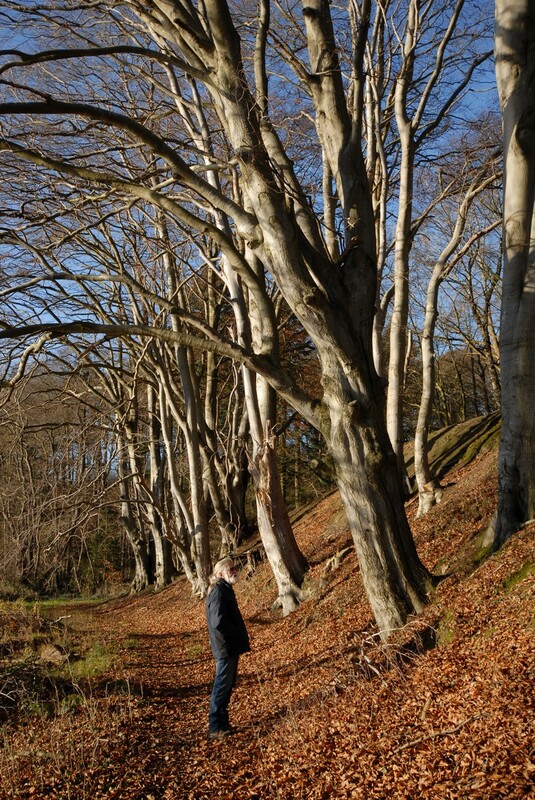 I was standing there, beardless, in flares, felling trees with a stone axe, shooting with a bow and so on. For the first time there was public interest in what I was doing, at least in some places. Still, many were asking: What good does that do? It will only be confused with the originals. I always said: “I can review how the originals were made!”. That wasn't of great interest to most, especially not when it came to my boss. She was a real challenge and I developed a thick skin. You are lucky that you arrived later – people would always criticise me: “Herr Paulsen, please remember, we are humanities scholars, not craftsmen!” I replied: “Do you want to bet that all those things you are looking at were crafted?” That was something they really didn't want to hear. There were teachers who warned their students about me; this Paulsen, he doesn't have a doctorate's degree. One was actually reproaching me about “escape to manual” (Flucht ins Manuelle). But once I made a Levallois core, and then came the moment – how do you say? The goalkeeper's fear of the penalty; I needed to accomplish the final blow. I finished it in a dream strike, just like in the books. In the background, said professor was mumbling: “Herr Paulsen, this piece is confiscated for comparison” (laughs). This is a great way to learn about the ancient techniques. Once, a scholar came to my office. I was just making blades and he mumbled astonished: “What? That's how it's done? Impressive! Indeed, this is exactly like the one on my excavation!” I replied: “I make them exactly like that!” (with a roar of laughter). That's how it went. Students booked workshops, but weren't allowed to tell. That's when it started at the Kinnekulle Bay (Harm's place at the Eckernförder Bay). We destroyed tons of flint at the beach, where the professors couldn't touch us. We weren't allowed to call it a seminar, so we called it a beach party. At the university they said: we are used to thinking in a different way than you! These were the first little warnings, because I was “stealing” their students. I should have had my old sofa listed as part of the protection of historical monuments, because of all the illustrious backsides – students back then, but today international men and women of position and authority – who wore away the leather. In Germany, none of the top brass wanted me, so I got invited to Sweden, where another spirit prevailed; the spirit of Scandinavia. I showed Kjell Knutsson, today a big shot at the University of Uppsala, that you can read a whole story out of aflint flake. We had a lot of fun back then! 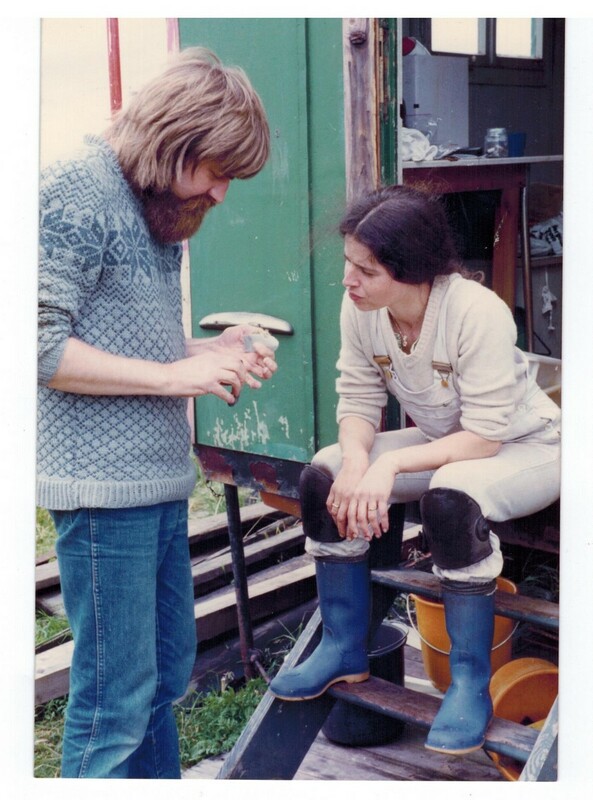 I presented my first attempts of axe making techniques – before 1970 there wasn't anyone who actually made flint axes. 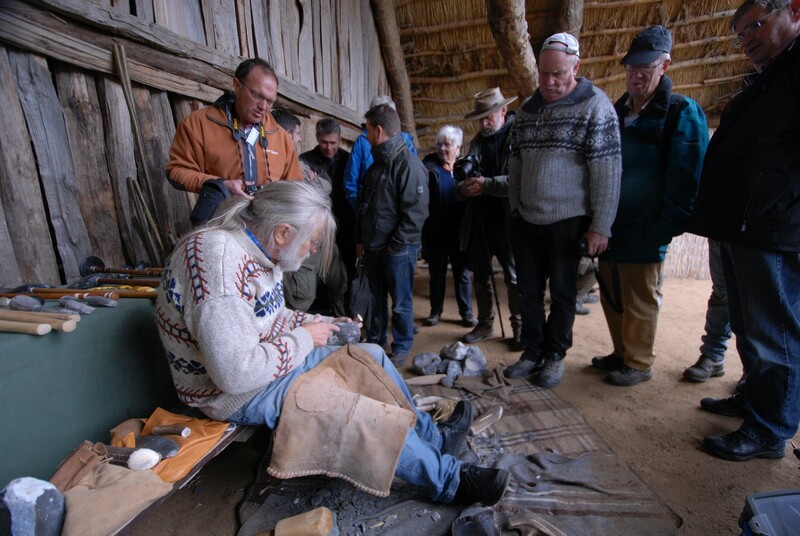 As such, we held international symposiums for flint techniques in Sweden. There were the Americans; in the US there existed a whole scene of flint makers, but they were difficult to get used to. 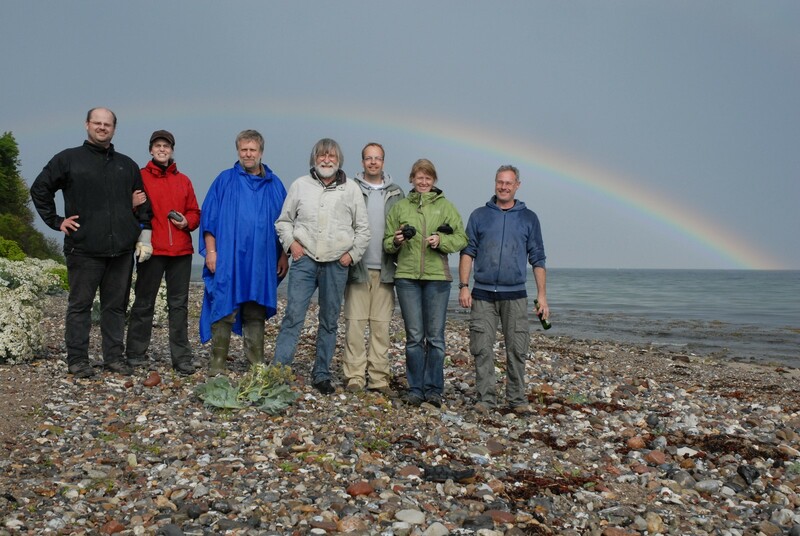 First, they were all after bifacesand wanted to make the longest dagger in Denmark, and second, they didn't expect to meet good flint technicians. I always asked them: What do you want with the daggers? With an axe you can build a house! One of the Americans tried to make an axe, but we weren't allowed to watch. Sometime later we found it in the bushes... (Paulsen laughs and reads some pages out of his diary, which aren't printed here due to data protection). There is a lot of lying when it comes to flint techniques, especially in the US. They brag and boast, but, for example, they sharpen whole fish tale daggers with a diamond point and just smooth the surface. I always say, I would believe in that dagger if I were able to see shell shaped blow negatives on the blade. It should be made realistically, otherwise there is no scholarly use in it. In 1977, we worked on the big dugout experiment. In the year before, we demonstrated how to make a dugout with stone blades at the Kieler Woche. It was something totally exotic for the press, and thanks to a misunderstanding, there was a rumour that we would travel from Schleswig, across the Baltic Sea, to Kiel in the dugout. My boss thought that it would be a perfect PR campaign for his museum and sentenced us to do the tour. I was doubtful – I am not afraid of the Baltic Sea, but the Schlei (a narrow fjord) with its short waves... they literally pull your pants off. It worked in the end, and after a lot of beer and adventures we went down the Schlei – 45km! - across Eckernförder Bay and sailed to Kiel. Before we left, a man who was collecting mail related objects that were transported in unusual vehicles like zeppelins, huskies et cetera, gave me a letter which I should carry in the dugout with me. The departure was certified in Schleswig and back in Kiel. I pulled the crumpled piece of paper out of my bag, which the mayor himself signed, it was a big thing in the newspapers. In the meantime I made so many dugouts, but after 30, I had to stop! It is like this: There is a huge trunk, people are getting scared and run away and you stand there all alone with your big stone axe. Once you start working, they come back, sitting on the trunk like hens, eating, drinking beer, while the lonely axe blows echo over the lake (laughs). It's not totally true, in Hjerl Hede there were always people around, and once the dugout is done, it's fun. I've never been like all those lonely adventurers and survivors, I just wanted to know: how to drive a dugout, depending on the shape, and why did many build in a bulkhead? We discovered that quite quickly. When you capsized in a dugout – well, actually it is quite difficult to capsize, even though it is shaky, but there are people that are able to capsize a raft (we are convulsed with laughter!) - then the bulkhead helps to get back in. There is no chance to get in via the side or the bow. At the stern, you just put a foot on the rim and pull yourself in. It is also useful when pulling a net back in. This is how I created a small pool of information and experience which is also of interest to the archaeological profession. Speaking of Hjerl Hede – that's an open air museum in the North of Denmark with a „Stone Age“ section – how long have you been there now? Since 1978. Hjerl Hede is my playground, I am there every summer for a few weeks and try out a few things, sometimes over a longer period. For example, everyone has their own flint dagger which they use when they are in the Stone Age village. Every year, I look at the knives, some are in use for over 25 years now; I look at the edges and the utility traces – these are highly interesting! We have also been working with sickles – the ones with the flint blade inserts. We change the blades after a certain length of time, then after twice that period of time we change the blade again, and so forth. I can place them next to each other and can tell you how long we have been working with them and which traces are left behind. 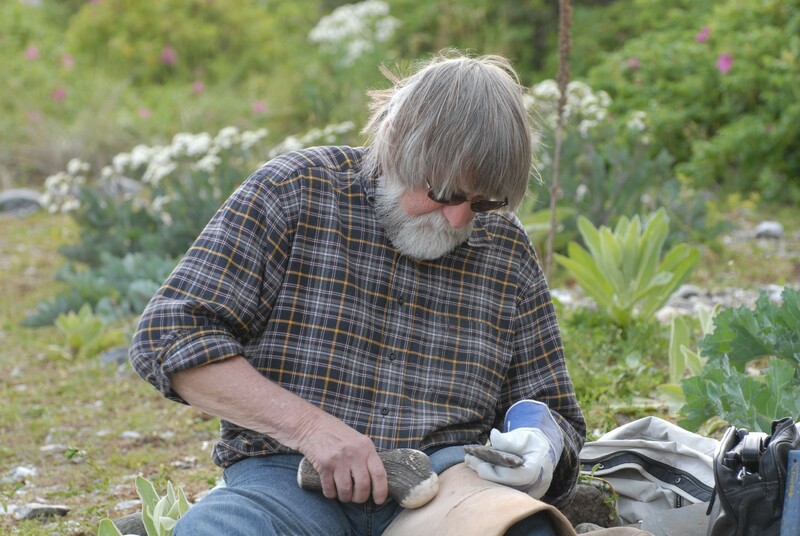 For some, experimental archaeology is just an experiment. They have three stems of wheat, “I am holding them in a certain angle and cut them”, a lot of applause, but...now do a whole field....then you notice your hands. There are silicates in the stems and the blades get a polish. In the Netherlands there are sickles with a polish where the retouching was almost gone, why is that? I made a whole set of sickles for a Dutch professor, who built a machine which cut wheat endlessly, but the polish didn't want to come up. I asked her what else was cut in Holland and then they started cutting peat. Suddenly there was a beautiful polish on the blades! As has been often the case, I was part of the solution to an experiment. How many generations “grew up” in Hjerl Hede? Three. For example, me, my son and my grandson! The director is an ethnologist and some time ago, there was some talk about savings in the museum. She turned around and realised that we are the most “economic” in the Stone Age. We all have our own set of leather clothing which we wear everyday. The employees in the rural part of the open air museum got a freshly washed set of clothes every morning. We would look much more authentic in our worn clothes and save money, she said. The wanted to do the same thing in the modern part of the museum. She looks at us like the “core” and she is right. We share the most amazing part of the year and get very close – some did marry there actually (smirks). The most important point is the communicating. In a lecture, I reach 20, 30 people. In Hjerl Hede, thousands in a year. The favourite thing for the visitor is to see things that aren't true, to prove that this or that didn't exist in the Stone Age. Sometimes they are just too easy to provoke. For example, one year I had all the girls wear copper spirals in their hair. The visitors protested, and we were able to explain that there is a time between the Stone and Bronze Age, the Chalcolithic, the time of “Ötzi”, where stone and metal was used simultaneously. By the way, we built everything on our own, without any support of EUmoney or other funding; houses, living places, boats, they are all made with passion. 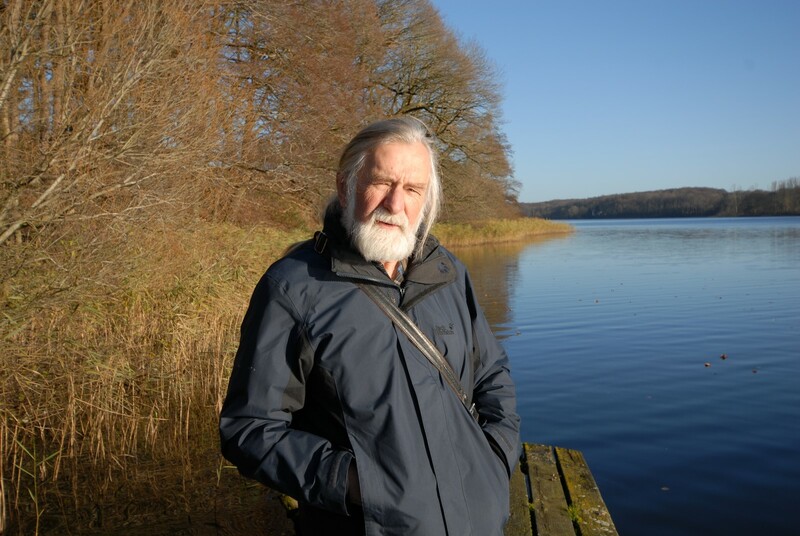 What are you doing when you're not in Denmark – especially now that you are retired, although you are still busy, right? I tried to do my part for the archaeology. Often the media needs reconstructions, they want to see Stone Age techniques being done live. For example, when it comes to “Ötzi”, I was the man of the first hour – good Lord, what kind of nonsense was spread about this man: “They shot him while he was hiking, and then he pulled out the arrow under extreme pain!” I said: “Guys, “Ötzi” was wearing a backpack on top of his clothes. It is not that easy to get through all of that with an arrow. And where did the arrow hit him, which angle? 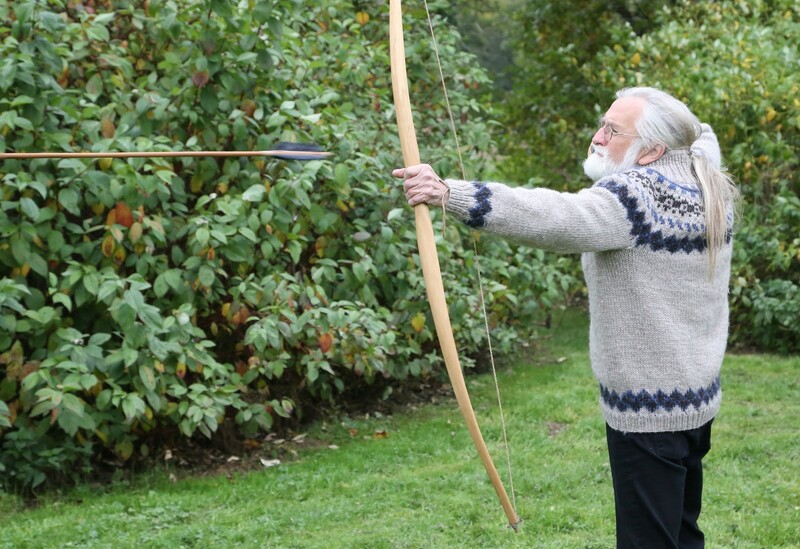 I put the arrow in that angle next to you, Professor, and you try to pull it out. It doesn't work? How peculiar..!” My theory: the Iceman sat bent over and was eating, which we know thanks to his stomach content, when he was hit by the arrow. The arrow came from over here, it is a simple story, really (simulates the scenario). At an “Ötzi” congress, the reference list looked like this: Prof. Dr., Prof. Dr. Dr., Prof. Dr., ….Paulsen....Prof. Dr. Dr., Dr.... (laughs), and then an Austrian professor uttered that he was ritually killed with his whole equipment. I said to him that the arrows had a smooth surface where they broke and asked whether he had seen a ritually broken arrow before, which he denied. “That's a good thing”, I said, “over there you can see my reconstructed equipment and I will break one of my arrows ritually”. I almost made a complete circle with the wood before the arrow broke with a loud crack and the ends looked like two shaving brushes. “Why does this not fit in with your theory, professor?” I asked him and everybody laughed, but one. Naturally, you rub someone the wrong way – but I mean no harm, and I don't want to sound too arrogant, but sometimes all this twaddle gets on my nerves. I just want to share my experiences so that everybody profits from it and when fighting with colleagues and specialists, you have to be prepared to question your own theory and then make up in the end. Now to probably the most often asked question in interviews with you: What was the best experiment you ever undertook? Or put differently: What was the most impressive, the one with the greatest break through? We both participated as experts on TV shows where people lived like those in the Stone Age, me in Switzerland, you with the SWR (South West Germany Radio and TV station). How was that for you? Today, we cannot live in the Stone Age! Not that we are not able to, technically, but we're missing the right software. For example: Stone Age people were much more attached to nature than we could imagine. They had roughly 30 different words for “wind”. Our head is bursting with modern stuff; driving a car, learning English, computers. There isn't much space for nature, maybe two percent. And these two percent should be used in such an “experiment” (indicates the quotation marks)? To create a 100% Stone Age? That can't work! Stone Age – the experiment... I was thinking a lot about it: What if it could go on? After the winter, everyone would be dead – starved! The show was long finished, and the TV people brought everything back in the winter. That was a real elegiac picture; everything empty, clay pots in the snow storm, a door that rattles in the wind, you could actually see that it was a failure! I always call it “Robinson-Crusoe Stone Age”. When Tom Hanks ends up on a deserted island (Cast Away), he will use Stone Age techniques to survive. That might work in the South Sea, but that doesn't turn him into a Stone Age man. You can put on as much Stone Age clothing as you want, but you will always stay a modern man. We cannot feel and think the way these people did back then. I totally agree. Nevertheless, I thought the project was interesting and I learned a lot. When the Swiss participants left the stilt house at the end of the show, the archaeologist Urs Leuzinger and myself took out the dugout and took 2 gigabytes of picture data. I thought that the small things were the most impressive. For example, the collection of sticks and pine cones, we didn't know what to do with that, until the candidates told us; they built a sun dial and a calendar. You wouldn't find nor recognise that in an excavation! Right. I suggested that they fenced in our houses in Oberschwaben; let them decay naturally, excavate them later and check whether the past can be read in the excavation reports. Unfortunately, this wasn't a real option. Does that mean you don't object to those Stone Age games in general? Let me put it this way: it was an attempt, but generally I don't support it. Naturally my whole heart was in the project, the people were incredibly nice and tried their best. We are still in contact with each other. But basically, it was my boss's wish to take on that job in the first place. Still, it was a nice experience and I could give a lot of tips. But even when I'm in Hjerl Hede, I don't try to be a Stone Age man. It is theatre, we want to show the people a certain picture of how it could have been back then. Sometimes you can put yourself in those people's shoes. In Denmark, they found a bunch of chips from making a dagger, with half of the dagger in the middle of the site and the other half, 30m away in the moor. As a flint smith you know exactly what drama happened there thousands of years ago. But only, because you can make such a dagger yourself and scream sh** a couple of times and throw that stupid thing into the corner, because the blow didn't hit. The people were biologically exactly like us, they could love, hate, be nice, be bad, they had everything in their repertoire, but what about for example, morals? How did they express them? A hundred and fifty years ago men fainted when they saw the naked ankle of a woman. In the 1970s people were running around naked on the beach, now most wear a bathing suit again – what happened? You cannot find that in an excavation! That's why I didn't pay too much attention to the immaterial world of the Stone Age, the world behind the things were always suspicious to me – and because everything you don't understand directly, is interpreted as ritual. But, to be honest, we did provoke in Hjerl Hede from time to time and painted our ovens and houses in bright colours. I don't care about the theory that Stone Age man were running around in rags – their tools were beautifully adorned, why not their clothing too, even though we cannot prove that. Take the Mesolithic – look at the Timmendorf knife, with its ornate handle; boats are 13m long with beautiful ornate paddles To deal with ordinary, small things such way, a whole new world is opening up to us! The practical side is different, you're allowed to make conclusions. I often dispute with other friendly archaeologists. To one I once said: “The people back then only hunted stags during the winter” “How do you know that?” “Well, you just have to look at your own finds: where are the skull antlers? Look, stags don't have antlers during the summer. In the summertime people are at the beach, hunting sea mammals. They need blubber for their lamps. The beehive like houses supposedly had a diameter of 3m in the Mesolithic period? Hmm 3m, from here to there, in the middle a fireplace, roughly 1m in width, and then you want to put dried fish, bows, arrows, paddles and the rest of the household content in there as well? You want to put the bacon aside when you lay down to sleep? I am convinced that the huts had a length of 20 meters, we only haven't found them yet. These small huts are like when we go fishing at the beach in the summer; set up a small tent and lose three crown caps. “Yes, why did we find some pots there?” “For the blubber. That is what we do here daily in Hjerl Hede. We do not use the best pots.” I invented the term “socially relegated pot”: When something is burnt inside, the Stone Age people didn't care, it was smelly all the time around them, people say. No, on the contrary, their taste buds weren't ruined by spices yet like ours are. What do you do with such a pot, no one wants to eat out of it any more. It ends up at the beach, boiling blubber and then you empty the boat, when it's half broken. Because you asked: One of the most fascinating experiments was with Ertebølle lamps. Once, we made oil out of a small whale, it was already lying dead on the beach. I filled the lamps with it, these pottery clay lamps. And what are you always reading in the literature: “In the lights of their smelly lamps, they eke out their existence.” Nonsense! They burn even and clear, brighter than candles and it doesn't smell at all. Then we measured the consumption, the light yields and lifespan. Incredible numbers, they burn forever. “But why did they need them in the boats, did they make fire in the boat, on a clay plate to lure eels? Then I had to say: “Friends, I am inconsolable, but I have to tell you that you cannot attract eels with fire on a boat. The board wall of the boat blocks it. But when you fill these clay lamps with bulrush wool, pour some whale oil on it and light it. Not even a strong wind can blow that one out. Put two of them on the bow and then you attract your eels!” I like to throw this back at those people who think that my poor Stone Age men were stupid. Goes without saying that I mean well. I did another important experiment with a Danish nuclear physicist. She was wondering why the carbon dating results varied by a 1000 years from the coast to the inland. So I made a lot of Ertebølle pots and we cooked various fish soups. Some soup was made with fish from the river Alster, others from the river Trave. In some of the other pots we cooked pork. We let everything burn until it looked really disgusting. Then they took samples from the crust for carbon dating. Apparently both fish soups were about 980 to 890 years old (laughs out loud). There was nothing unusual about the pork pot. This is caused by the so called water hardness effect: The rivers acquire old lime particles, the fish absorb them with their food and thereby distort the results of the carbon dating. That's something you need to consider! For another experiment, for English specialists, I made about 20 Stone Age pots. For days they cooked different things for exactly one hour. The Brits took the dirty pots with them on the plane (laughs), cut them open at home to analyse which “fingerprint” is left behind in the pots by the various ingredients. Their work is so exact, they use ceramic knives to cut the vegetables and meat and ceramic scissors to cut the pots, so that there will be no chrome on the samples. I asked them how it went and they said: “Carl is walking around happily” and I knew it had worked. They were able to not only pinpoint that there had been olive oil in the amphorae you found, but also that it came from the North of Spain! These aren't the most spectacular experiments with bow and arrow and war cries, but they show so much more in the end. Those that experiment are the specialists in this case. I am a craftsman specialist. I offer them my experience in making AND in using the pots. It is not so easy to boil water in an Ertebølle pot, because if done incorrectly, the water evaporates before it boils. You need three stones with their tips pointing inwards, so that the pot barely touches the stones and gets as much fire as possible, only then will it boil. I think our guild, however you call it, gives advice to specialists. We won't find the philosopher's stone, but it is the small things, that paint the big picture. 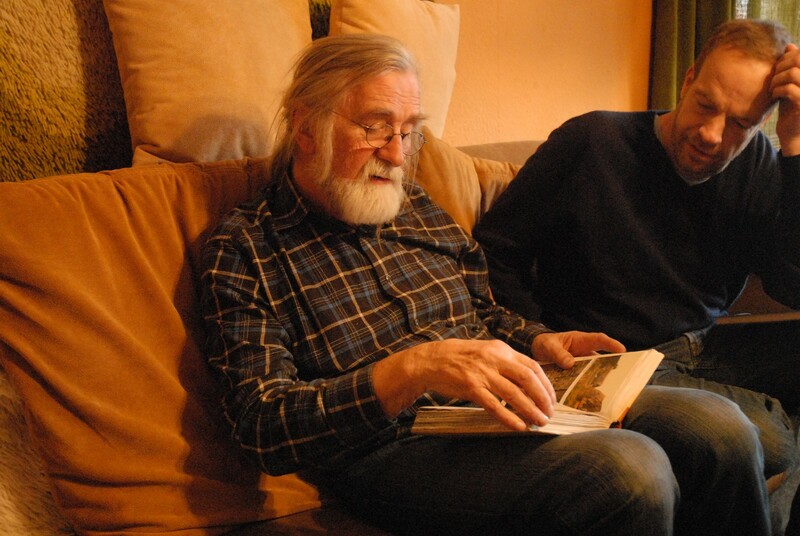 That's why I love what Professor Daim, who also sat on my couch as a student, created in Mayen (LEA – lab for experimental archeology in Mayen, supported by the Römisch-Germanisches Zentralmuseum). If in the near future a student wants to write a thesis about, let's say pile dwellings, he or she should get a basic education in prehistoric wood processing, get familiar with the tools, learn how to read tool marks et cetera. Then he/she gets a certificate and can start working on the thesis. The same goes for ceramics, forging and so on – this lab should be used more often! We are working on the Battle of Tollense. Roughly 3000 years ago, two Bronze Age armies – yes, you have to call them armies! - collided. We started in 2013 and 2014 running some trials on flint tips and bronze tips. Someone showed me some damaged bones a couple of years ago and asked: is that a hole from an arrow? Why is it there? I always have to say, yes it could be, but it could also have happened from a trowel during the excavation. Therefore, our question was: what happens if you shoot a human being with an arrow? What do the arrow holes look like? What happens to the arrow tips? Do the results vary with different materials? Now we have a collection of replica arrow holes, made under realistic conditions to compare with the original. I built about 40 arrows as exact as possible and shot pigs with them, as they come the closest to human skin and bone. The same bow was used for each, although the distances varied. The results were impressive: An arrow, shot from a distance of 22m, smashed through 31.5cm of meat. I presented the comparisons and experiences to an institute; now they can see whether there is a crack or a huge hole. I also showed them that flint tips are much more effective than bronze tips. It was a formative experience for everyone who worked on that project, not only seeing the results but also hearing the sound of a passing arrow and the sound it makes when it hits the body: I wouldn't want to be that body. The experiments will continue in 2015. This time thinking about: do arrow wounds differ from those of other weapons? We will use heavy machinery like swords, axes, daggers and clubs and we will see what happens. What are your thoughts on the future of experimental archaeology? Let's be honest: the time of the big experiments did pass quite quickly! After that it was only things like: How do I burn poppy seeds? Basically the main topics are cleared up, the last fish tail dagger is made, the last sword is forged and the last fibula is cast. And I doubt, an alien culture will be found that we need to reconstruct (we both laugh out loud). The fields became smaller, you don't need to cut down two hundred oak trees with an axe again to see how that works. You can get cracking at it with improved scientific methods, slow-motion pictures and better techniques. But everything has been done at least once. For me, it is important to support scholars and students with my experience. I would imagine that we as specialists should take on a more lecturing role to provide others with our knowledge, who, due to lack of time, cannot just learn it all. Otherwise I don't see unbreached topics apart from very specific ones like for example Tollense. Long term experiments are always important. What would you say to future experimental archaeologists and those that would like to start working in that area? If you don't have a clearly shaped problem, don't start. Don't jump around like a bee from flower to flower. For instance: today I am doing this, tomorrow something totally different, stay focused on one task at a time. If you start something, you should end it properly, and don't do anything that has been done about fifteen thousand times before. It is essential to have some crafting knowledge. My experiences from all those long years I spent in the Stone Age have shown that these ages weren't primitive at all! I don't miss my modern axe. You just need to know how to use the old one properly. By now they aren't destroying things any more in Hjerl Hede, because they have gained enough experience. We both know that when you are working on a stone axe for days, you lose focus for a second, there is a visitor who thinks it is his calling to also work on the dugout and bam! One blow, and you need to make a new axe. Annoying! And that happens with basically every experiment. I think that experimental archaeology is very popular, everyone wants to do something but there is a lack of craftsmanship. You can know everything in theory, but that doesn't tell you how to do it in reality. 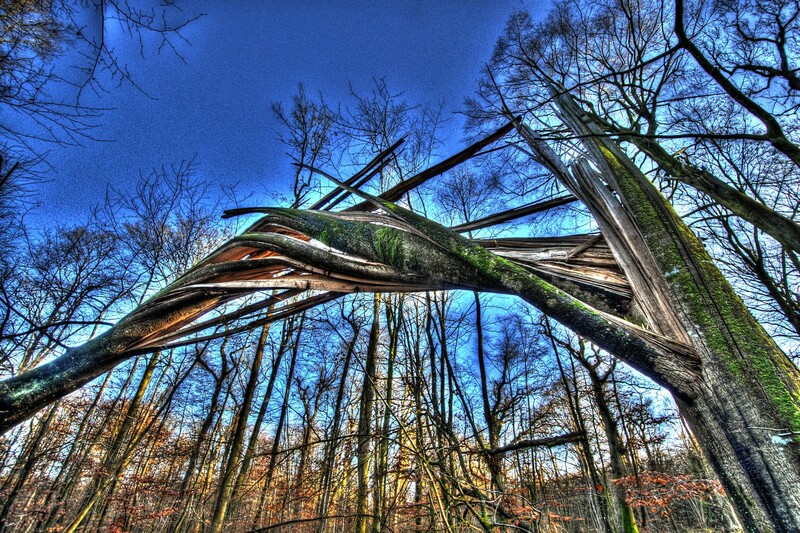 But naturally, things broke as well during prehistoric times. If there was a sound recording with every broken axe we found, you would hear a lot of cursing (laughs)! How does a big German news magazine always say: Herr Paulsen, we thank you for your time!